HP Spectre Folio review: T3 goes hands-on to find out if it truly is "the PC reinvented"
HP's latest Spectre comes wrapped in leather and aims to deliver high-end 2-in-1 performance. Does it succeed? 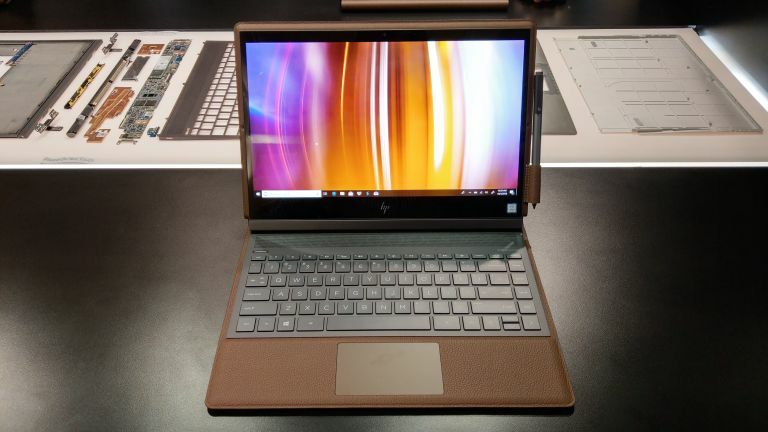 HP has unveiled its new Spectre Folio 2-in-1 hybrid PC at a dedicated event in New York City, which naturally T3 attended, and what follows is our hot take hands on HP Spectre Folio review. The event, which was entitled "The PC Reinvented", introduced the new Spectre Folio and its unique melding of metal and leather, with the latter material completely encasing the system's exterior. To immediately get a good idea for how the Spectre Folio looks and feels, check out its official video launch trailer now. Unlike the majority of other 2-in-1 systems, that leather exterior is not a case or keyboard cover, but part of the system itself. So, instead of having a plastic or metal casing, the new Folio Spectre has a leather one, with a hinged magnesium frame and aluminium keyboard contained within. The Spectre Folio comes with an all aluminium keyboard. And, while the leather exterior feels very premium in the hand, it is that internal frame that is arguably the highlight with the new Spectre Folio. It is hinged so that the entire system can collapse down, like a newspaper or magazine, to a very flat, low-profile, making it very portable. Picking it up in the event, it was immediately obvious that the Folio would be perfectly at home being carried in the hand, with the leather finish providing a tactile grip and, something we like here at T3, a luxe, stylish finish. This is not a system you will need or will want to carry hidden in a backpack. The Folio can collapse flat to a very low profile, adding to its portability. That internal frame also makes for very smooth transitioning between the Folio's various usage modes. From a closed, flat positioning, the system can be opened into a traditional laptop mode, then via manipulation of the hing you can bend the screen forward into sketching or media watching mode, before finally rotating the hinge fully into tablet mode. Transitioning backwards and forwards between laptop and tablet mode in Windows 10 was handled very well, with zero lag and the system staying responsive at all times. Laptop and tablet mode being used to consume the quality content on T3.com. It's all very natural and intuitive, and thanks to the fact that everything is integrated, it felt to us that it was a more accessible 2-in-1 experience than standard. Indeed, the only aspect of the system that is removable is the included Tilt Pen digital stylus, which has a hoop holder on the right hand side of the system's screen. This stylus delivers over 4,000 levels of sensitivity. The Tilt Pen digital stylus comes included with the Spectre Folio. Specs-wise the new HP Spectre Folio comes packing 8GB of RAM, an Intel Core i7-8500Y CPU, and a 256GB solid state storage drive. Screen resolution can be taken up to a very sharp 4K UHD (with the screen coated with Corning Gorilla Glass), while battery life is stated at 18 hours, too, which if true will make the system one of the best performing machines in the 2-in-1 category, even going up against HP's own ARM-powered HP Envy x2. Naturally, until we can test out that battery in our full Spectre Folio review, we'll withhold judgement. Overall, then, it's hard not to come away from going hands on with the new HP Spectre Folio quietly impressed. Considering that many considered the PC market to be dying five years ago, but the 2-in-1 market has shown that there is definitely life left in it yet, and the Spectre Folio is now right on the cutting edge of 2-in-1 innovation. It may not be the PC totally reinvented, but HP certainly have reinvented how 2-in-1 systems can be perceived and used, and for that they should be congratulated. The Spectre Folio is a very premium and stylish device that does something different within the rapidly evolving 2-in-1 space, and does so while also delivering some quality hardware, too. The leather chassis looks and feels great, while the magnesium hinged frame seems very well engineered, with robust, well-judged levels of resistance on offer. The Spectre Folio's hinge has a well-judged level of resistance. A shoe-in then for T3's best 2-in-1 laptop guide? Almost certainly if this strong early showing is maintained through the full review. Be sure to check back in to T3.com soon to get the full HP Spectre Folio picture.